Extraordinary breaking news as the megabucks US arena tour of Jesus Christ Superstar was cancelled amid confusion and shock.The production was due to open in New Orleans on 9 June and was scheduled to play arenas across the US over the next two months before ending in Philadelphia on 17 August. With a 50 date tour, more than half a million tickets were available, with a potential gross in the tens of millions of dollars. The luxury cast included Incubus lead singer Brandon Boyd as Judas Iscariot, JC Chasez of ‘NSync as Pontius Pilate, Former Destiny’s Child star Michelle Williams as Mary Magdalen and John Lydon, aka Jonny Rotten, as King Herod. Jesus himself was to be played by Ben Foster. The smash hit musical, written in 1970 by Lord Andrew Lloyd Webber and Sir Tim Rice, successfully toured the UK as an Arena Tour starting in 2012, following a prime time TV casting show to search for the new Jesus, a contest eventually won by Ben Foster. Foster was lined up to play Jesus on the American tour. 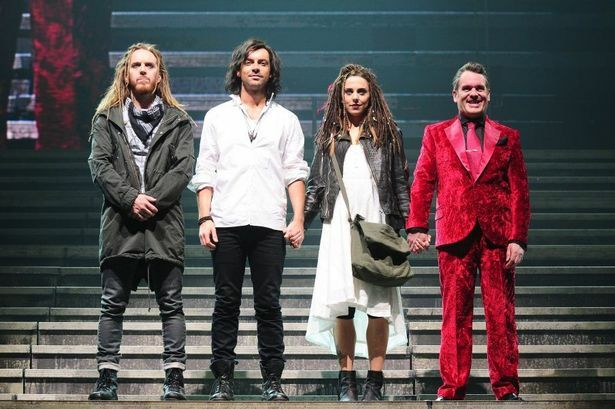 The UK tour featured Tim Minchin as Judas, Mel C as Mary Magdalen and Chris Moyles as Herod. Details of why the tour has been pulled are sketchy but reports suggest that one of the backers of the tour pulled out at the last minute. What is clear is that the cast and crew will now be looking for work. According to reports on social media, the cast were told during a runthrough on 30 May. Ben Foster commented on Facebook: “I am so devastated. I’m sorry to everyone who got tickets and flights..Who ever f*cked it up I hate u . But ?#‎IforgiveU? ?#‎imjesus?..wellwas x”. JC Chasez tweeted: “When it rains it pours”. Ticket holders will be able to refund their tickets, but presumably will not be compensated for any incidental costs incurred, such as flights or hotel bookings. As more details emerge, showbusinessinsights will keep you informed. This entry was posted in arenas, musicals, Theatre and tagged andrew lloyd webber, arena tour, Ben Foster, Brandon Boyd, cancelled, Chris Moyles, Incubus, JCS, Jesus Christ Superstar, Jonny Rotten, Michelle Williams, musical, Tim Minchin, Tim Rice by showbusinessinsights. Bookmark the permalink. Could be… I suspect it was poor ticket sales, but we shall see as details leak out, not doubt!